In our current Spring issue, we have a story and photo spread about seeing Orlando from above by helicopter. We also have written about the Characters in Flight tethered balloon ride at Downtown Disney. Now a new option has opened up with Old Town Balloon Ride. Lynn and Dave Rigby opened the new attraction in Old Town, the small shopping and attractions complex on U.S. 192, just a couple of weeks ago. The balloon is very noticeable when up but you may not have seen it yet since they’re grounded when the winds get too strong. The balloon itself is very similar to the Characters in Flight one. Both are filled with helium and are tethered by cable to a motor on the ground. But that’s about where the similarities end. While the balloon at Disney lifts a large circular platform holding up to 30 guests. 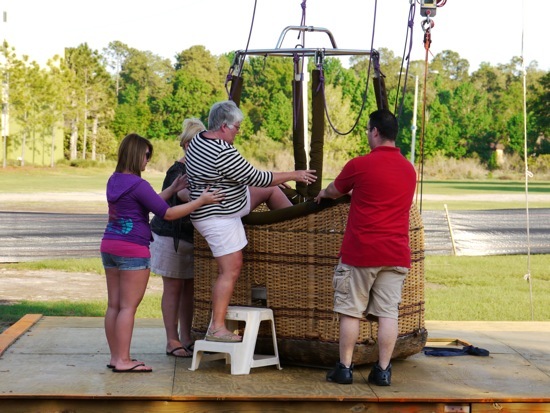 The Old Town Balloon ride lifts a basket which holds up to five people (or 900 total pounds). This gives the Old Town Balloon more of an intimate feel, like a true hot air balloon ride. Because the basket is small, the staff doesn’t ride up with you, but a walkie-talkie is provided in the basket so you can contact the staff below. The ride lasts eight to 10 minutes, but if they’re not busy they may let you float a while longer. 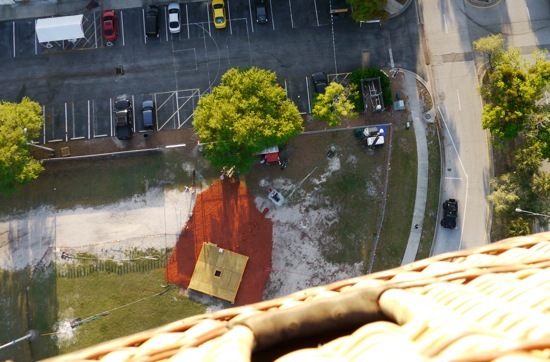 The balloon takes you about 300 feet in the air. The views are fantastic from that altitude. Different times of the day also bring different views – from bright sunlight, to sunset, to seeing the lights of the night. They’re also offering morning sunrise rides by reservation. 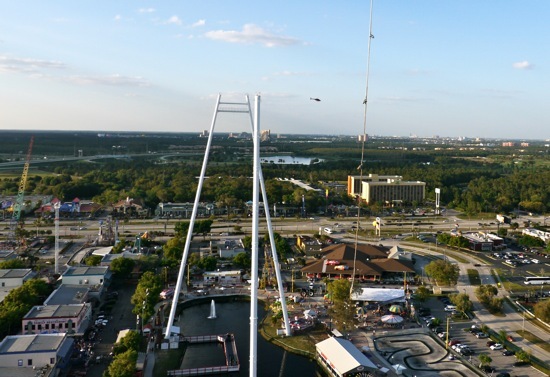 Besides the U.S. 192 area, you’ll see views of Disney and downtown Orlando in the distance. 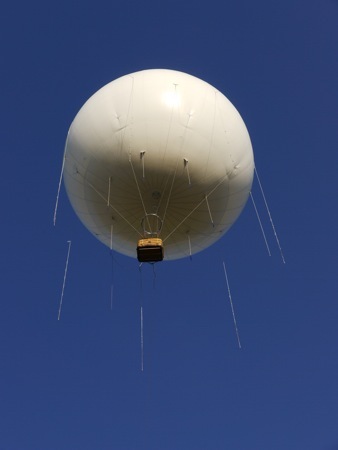 Owner Dave Rigby has been a pilot for 20 years and all of the staff took part in training from the aerostat balloon manufacturer. If the worst should happen and the balloon is somehow released from its tether, once it reaches 1,000 feet a release value will let the helium leak out, bringing you slowly to the ground. The owners are always monitoring the wind from multiple locations. They won’t operate the balloon if the wind gusts get above 18 miles per hour. They typically like to only go up with the winds are at seven or eight miles per hour. 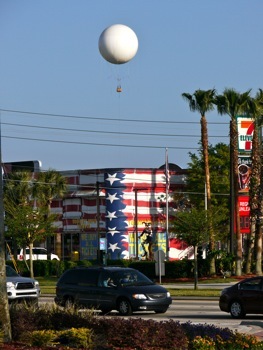 Right now the balloon is a solid off-white color but owner Lynn Rigby said they’re still deciding on a final design. The rides are $15 per adult and $10 for children. They operate from 11 a.m. to 1 a.m. every day. The balloon is lit from the inside at night. 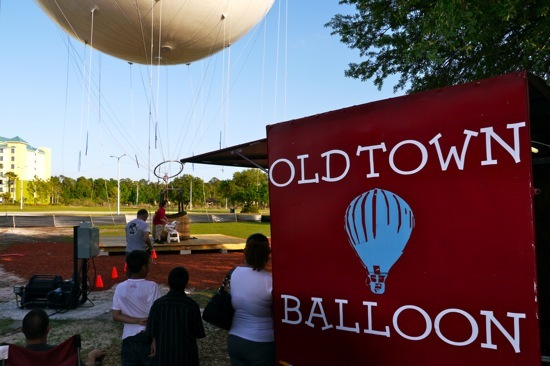 Old Town Balloon Ride can be reached at 321-284-7506. The basket doesn’t have a door, so you’ll need to be able to climb over the basket using the provided steps to get in and out. As you can see here, the balloon lifts you about the same height as the tour helicopters fly. 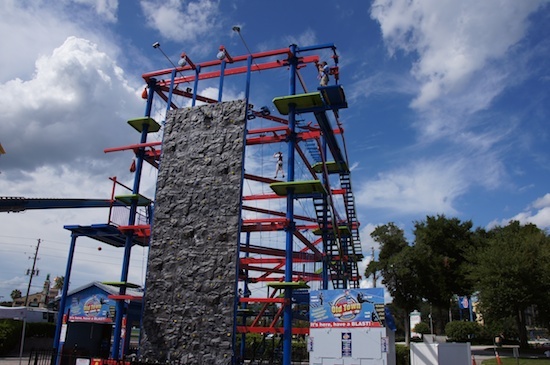 It’s also about the same height as the sky coaster drops you from at Fun Spot next door. If you’re at all afraid of heights, don’t look straight down. If you do freak out, you can use the provided walkie-talkie to tell them to reel you in. A zoomed-in view of Spaceship Earth at Epcot as seen from the Old Town Balloon. 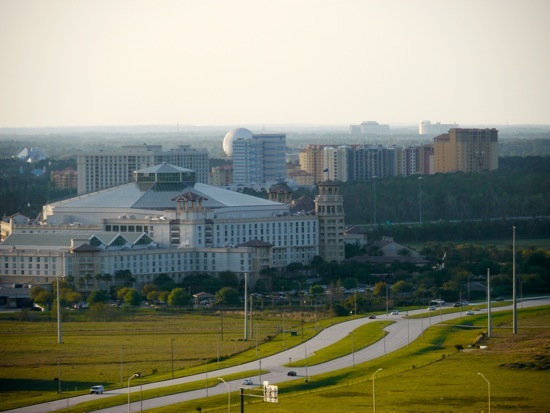 (The Gaylord Palms Resort is in the foreground.) Binoculars are also provided in the riding basket. 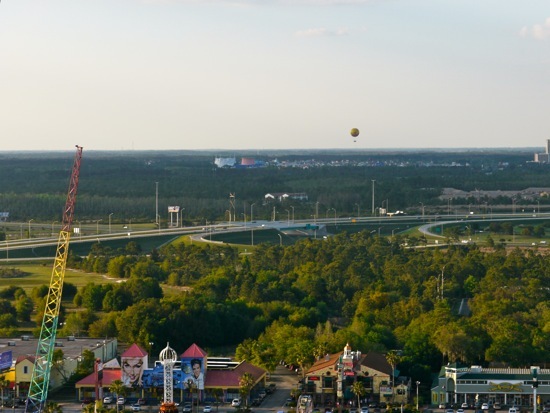 Beyond Interstate 4 is Downtown Disney and Orlando’s other aerostat, helium-filled, tethered balloon ride. 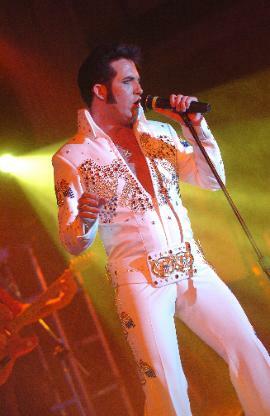 Wednesday nights at Old Town will be All Shook Up now through August as Dwight Icenhower performs Tribute to the King concerts. Icenhower will perform four shows with the first set beginning at 7 p.m. He will perform a variety of hits from all the Elvis years. Visit Icenhower’s Web site for a demo of his singing. 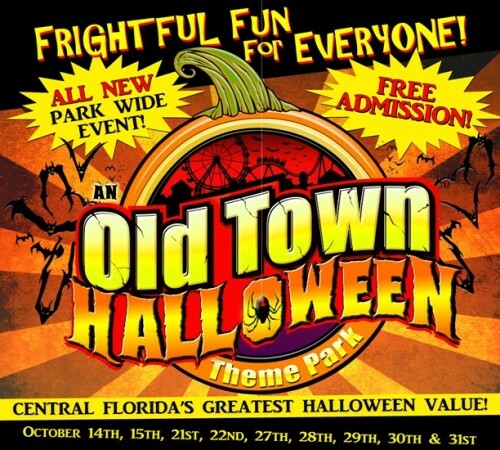 Old Town is located one mile east of I-4 on Highway 192 in Kissimmee. Old Town includes a shopping emporium with more than 75 stores, eight restaurants and 18 amusement rides. Believe it or not, the headline isn’t a slam on Old Town. Bug Fest is being held every Sunday in April. I’ve never been to this annual event that celebrates our insect friends, but it sounds like a good time. The local teen band, 535, will headline Bug Fest this year, performing each day of the event. More information can be found on the band’s Web site www.rock535.com.